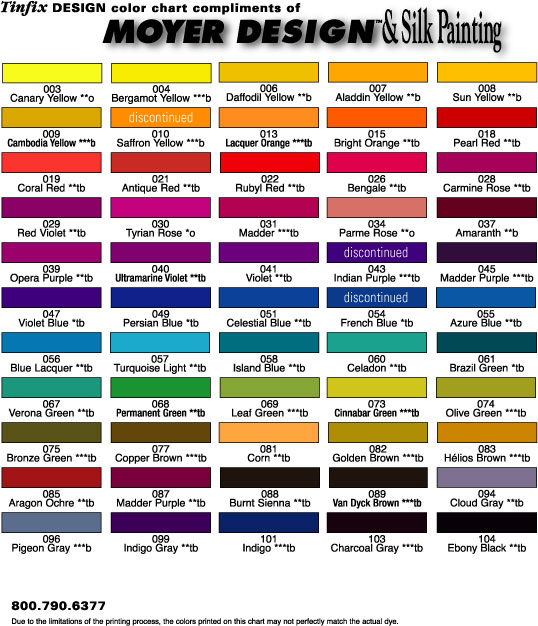 For your ordering convenience, you can print out the list of Tinfix Design colors. Fill in the numbers of the colors you want, then fax the list (along with the order form) to 1 707-964-7677. Because every computer displays colors just a little differently, the colors on this chart may not perfectly match the actual dye. For a Complimentary Color Chart call toll free, 800-790-6377 or FAX 707-964-7677. Â© Moyer Design, Inc. 2007-14. All rights reserved.